This is the blog supplement for the website Film Critics United and the television show Totally Twisted Flix. 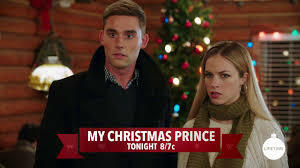 NOT to be confused with A Prince for Christmas, A Princess for Christmas, or a Christmas Prince... we have My Christmas Prince. A story about a girl who meets a Prince whose royal family isn't down with this nonsense, until her spunky Americaness wins them all over. I understand if reading that didn't elicit a Kaiser Soze type response. Samantha (Alexis Knapp) is a hardworking educator living in NYC dating Alexander (Callum Alexander), the charming diplomat from Maldelvia. These two kids seem to be getting along fabulously, but what Samantha doesn't know is that Alexander is actually the Crown Prince of Maldelvia, not a lowly diplomat, which will be exposed to her when she heads back to Maple Falls Wyoming to hang with the family for the holidays. Sam is a little upset by the deception, but as it turns out he's still the blandly handsome, boring, cardboard stiff dude she's been dating for the past year, so no harm no foul. Besides, Sam's folksy parents seem to like the guy. Don't think it was lost on an old head like myself that these parents, played by Parker Stevenson and Pamela Sue Martin, didn't headline the Hardy Boys / Nancy Drew mysteries way back in the 70's. The other Hardy Boy was Shaun Cassidy. Rest In Peace homeboy. (Well that's embarrassing. I've just been informed that he's not actually dead RIP David Cassidy). While Sam's folks might all good and fine with Prince Alexander, the prince's people... not so much. Particular his mom The Queen (Jane Carr) who can't have this commoner snagging her son, so she dispatches her right hand woman Felicia (Marina Sirtis) to Wyoming to keep an eye on things. Failing that, she also dispatches his Maldelvian Princess in waiting Baroness Clara (Catriona Toop) to further throw some confusion into the mix. Predetermined marriages, paparazzi, stress and disapproving royals is simply too much for poor Sam to deal with, so she determines that Alexander's world is a world she does not want to be a part of. But love will not be denied because... because it won't, okay? What do you want from me! My apologies, but having watched a half dozen of these movies, in which they are all pretty much identical, seems to be getting to me. I only have myself to blame for this. Anyway, the sappy Christmas movie vomit factor wasn't as high with this one as the others. We had plenty of snow, some version of canned Christmas music playing in the background and Christmas decorations off in the periphery, but there were other little touches we've grown accustomed to that were missing. 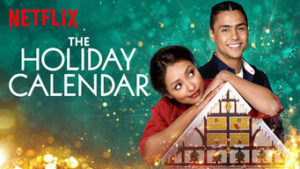 Such as no one shopping for a Christmas tree, no one baking cookies, and I don't recall seeing any random carolers either... though this movie did have the rather unique gingerbread house creation competition, in which Sam and Alex CRUSHED a bunch of punk kids with their Castle Wolfenstein creation of a gingerbread house. That was cool. They ate awesome looking Christmas Donuts as well, which I didn't know was a thing. As you can see, Sam on the right is wearing a rather snug, bright red move-something dress, while Leanne on the left is wearing a decorative army tent. That did help tilt the scales back in Sam's favor somewhat. But when it all comes out of the wash, what we have with 'My Christmas Prince' is Romantic Christmas movie that is a little lower on the vomit factor, and slightly lower than average on the entertainment factor. Folks who watch these kinds of movies can probably tolerate it, but I'm guessing they won't love it. Wait... what just happened in this movie? Um... okay... yeah... I'm kind of scratching my head trying to process this, that I have seen, and to be honest the process is malfunctioning. Probably not too uncommon at my age, but yeah... So what we're going to do, is what we always do, and just describe the movie to you and hope that after that's done this sad excuse for a holiday movie will reveal itself to me. Simple enough, Kelsey (Jocelyn Hudon) is a budding wedding planner, planning the gigantic Christmas wedding of her beloved cousin Emily (Rebecca Dalton) to the dashing Todd (Eric Hicks). Kelsey narrates for us via texts, detailing her various insecurities, that she sends to someone who never texts back. Pretty certain already who this person is. Because of the crapterpiece that was ‘A Christmas Prince’, I’ve decided to spend the next few days knocking off Royal Christmas movies. Why? Because ‘A Christmas Prince’ was so inspirational we want to experience all the magic that Royal Christmas movies have to offer? Of course not. Since using real royals are apparently off limits, we just want to see the names of the fake countries the filmmakers dream up. That’s pretty much it. No intros needed, now is there?